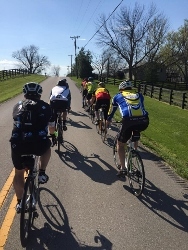 Please visit our Events calendar to see our weekly rides, as well as other popular events. L/C = Leisure/Casual Pace = under 10mph This ride will be casual and stops may be frequent, depending on the needs of the group. The ride leader will try to keep everyone together, or will provide an "out and back" or "lollipop" route that allows riders who want to go faster or slower to be monitored and assisted as needed. Suitable for beginners. The ride leader will assist with minor repairs. This is a social ride with an emphasis on having fun and learning or improving safe biking skills. C = 10-12mph The ride leader will sweep, or designate a sweeper, and will regroup frequently, and help with repairs. The ride leader will typically ride with the less-experienced riders rather than the slowest riders in the group, should those be different. 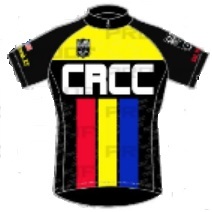 C rides will be casual with a focus on developing riding skills. B/C = 12-14mph The ride leader will sweep, or designate a sweeper, and will regroup frequently. The ride leader will typically ride with the less-experienced riders rather than the slowest riders in the group, should those be different. Intermediate cycling skills recommended. Riders should be able to change their own flat tires, although the ride leader may assist. B = 14-16mph Participants are expected to be competent in basic bike handling and bike safety skills, and should have experience riding with a group. Leaders are encouraged to sweep and keep the group together, but this is not required. The posted ride description should note whether the ride leader will sweep. The ride leader may help with some repairs. A ride at this level will be brisk and may involve a pace line. The ride has some stops and/or regrouping. Intermediate cycling skills recommended. A/B = 16-18mph Participants are expected to be competent in basic bike handling and bike safety skills, and should have experience riding with a group. Leaders will not sweep and may choose whether or not to keep the group together - the ride leader will typically announce his or her intentions at the beginning of the ride. Participants must be able to ride on one's own and perform one's own repairs. This ride may or may not include occasional regrouping. A/B rides typically involve pace lines. Advanced cycling and group riding skills are required. A = 18-20mph Participants are expected to have significant experience in group riding with advanced bike handling and bike safety skills. Leaders will not sweep or keep the group together. Participants must be able to ride on one's own and perform one's own repairs. This ride may or may not include occasional regrouping. These rides will be fast and typically involve pace lines. EF = 20+mph For experienced group riders who have advanced bike handling skills and who are used to riding fast under varying conditions in a pace line/rotating pace line setting. Emphasis is placed equally on advanced riding skills, and the ability to ride at speed in a tight group while maintaining control. Riders who do not possess both competencies should not participate in EF rides. Participants must be able to ride on one's own, and perform one's own repairs. Riders who cannot keep up will typically be dropped. Regrouping is possible, but should not be expected. Follow this link to access our maps on the Ride with GPS website. Maps may be printed directly from the site, or downloaded for use in a GPS equipped cycling computer.